Chambers Media Ltd are delighted to be working in partnership with The Builders’ Conference to develop all advertising areas. 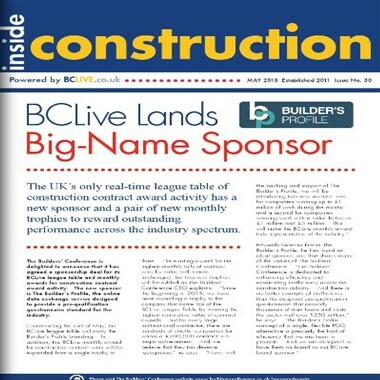 Inside Construction is read by over 50k of the UK’s construction key decision makers – Inside Construction is the Number 1 destination for comment, news and to find out who is winning the construction work via a Premier League table of excellence. See bclive for an hourly updated real-time league table of construction award activity. To advertise in the bi-monthly publication please contact ben@chambers.media. For any enquiries regarding The Builders’ Conference please contact neil.edwards@buildersconf.co.uk.